Instagram Stories are BLOWING up. Even though they are less than a year old, they already have more daily active users than rival Snapchat. Personal Instagram accounts are using instagram stories to check in with their friends or to give them a sneak-peek into their day. But what about for marketers and business owners? Can a business take advantage of Instagram Stories, create compelling content, and profit? Read on to find out how you can use Instagram’s newest feature to tell your brand’s story! 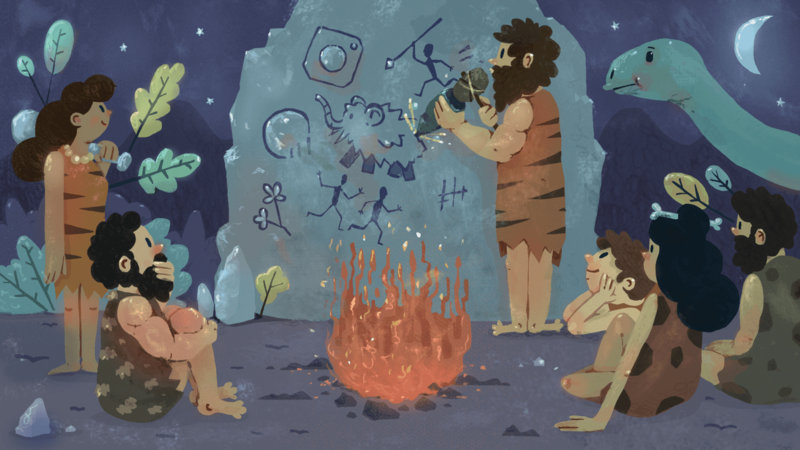 Marketing is no longer about the stuff you make, but about the stories you tell. – Seth Godin, bestselling author and entrepreneur. What are the benefits can your business reap from using Instagram stories? Increase Visibility: With Instagram’s Facebook-like algorithmic your account may not be receiving the amount of visibility you desire. Stories are a great way to increase your visibility. 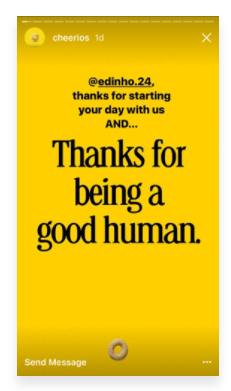 Humanize Your Brand: Instagram users are looking to connect with people, not brands. Instagram stories gives your audience a look at the people behind your brand. Add Dimension: Instagram stories add another dimension to your content. Stories can be used to give a behind-the-scenes look into your business, show your audience the creation process of your content, and more! Real-Time Marketing: Real-time marketing is about telling your target audience about what’s happening at your business when it’s happening. Instagram stories are the perfect platform for real-time marketing. Increase Communication: Instagram stories let viewers send messages to the account who posts the story, giving your target audience a direct means of communication with your business. Engage Followers: Last but not least, Instagram stories are a fantastic way to keep your followers engaged. This article is designed to teach business owners how to create epic Instagram stories to increase their customer engagement. MORE TO SEE! Download 5 more examples of brands that are creating epicly engaging Instagram stories! Posting 100 stories/day won’t be engaging for your followers if the stories don’t have any purpose. Is the story adding value to your business? Would your audience want to see what you’re posting? The end-goal of your story could be anything from getting followers to sign up to your email newsletter to showing your brand’s enjoyable work environment. Recommended Action Step: Post stories that complement your permanent Instagram posts. For example, if your posted a picture of a new product also post an Instagram story that highlights the product’s new features. What’s a story without a beginning, middle, and end? When planning out your content, make sure to tell the whole story. Recommended Action Step: Use a storyboard with sticky notes if you can’t map out the story in your head. Instagram allows users to upload previously taken photos and videos from the last 24 hours onto their story. This is good news for you because it means that you can make each video clip perfect before posting it online.
? Instagram Story Hacks: 18 Little Known Features You Need to Know About ? Start your story with something eye-catching or attention-grabbing and then build up to the point or end-goal of your story. By building up excitement, you make it hard for the viewers to look away. Recommended Action Step: Start your video with an aesthetically pleasing subject or visual and then move into the frame to make your story look like a well-planned movie. Think outside the box when it comes to the content you post on your Instagram story. The best way to keep your audience engaged is to provide them with unique content that they’ve never seen before. Recommended Action Step: Follow your favorite creative brands on Instagram to get inspired by what they do. But remember to add your own creative twist. 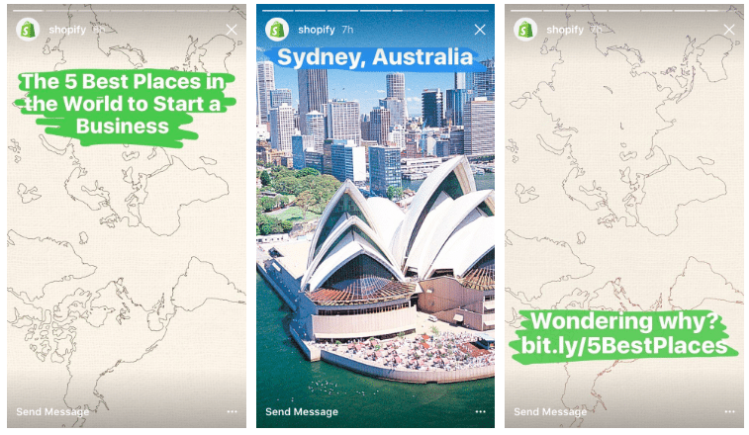 For example, Shopify used their Instagram story as a way to entice viewers to read their full blog post on the 5 best places in the world to start a business. Posting what you ate this morning may not be relevant to your audience (or maybe it is). The point is to post content that your audience will find useful and valuable. Recommended Action Step: Use trend generating programs such as Buzzsumo to see what your target audience is talking about. Example: Vogue recorded the 2017 inauguration ceremony knowing that their audience would find it relevant and useful to watch their story. 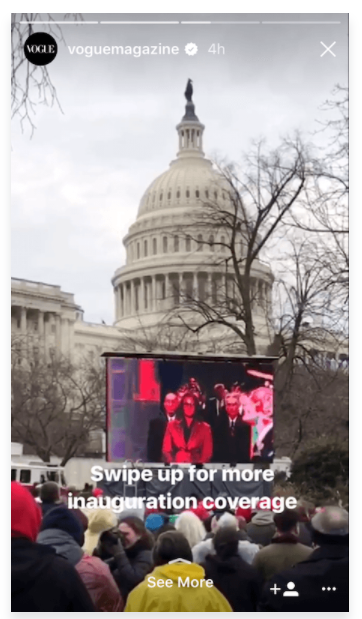 The live feature on Instagram is a great way to boost your real-time marketing efforts. Go live before you drop a new product line, when you’re behind-the-scenes at a photoshoot, or anytime you think it’s relevant that your followers see what’s happening when it’s happening. Recommended Action Step: The live feature on Instagram not only alerts your followers when you’ve gone live, but let’s them ask you questions in real-time! Talk about engagement! Example: Stand Up 2 Cancer invited their followers to a live Q&A with Sharon Jones. Ask a relevant influencer if they would like to take over your Instagram for a day – or vice versa – takeover their Instagram. This is a fun and effective way to keep your audience engaged by giving them someone new to look at. Takeovers are also a great way to reach a new audience, gain new followers, increase credibility, and build good relationships within the Instagram community. Instagram offers a myriad of applications that can add another fun, eye-catching element to your story. Recommended Action Step: Use Boomerang to point back and forth to something of importance. Sneak in CTAs within your Instagram stories. If the purpose of your story is to get viewers to drive traffic to your website, then ask them to visit your website. Try not to sound bossy or desperate when asking viewers to perform an action. 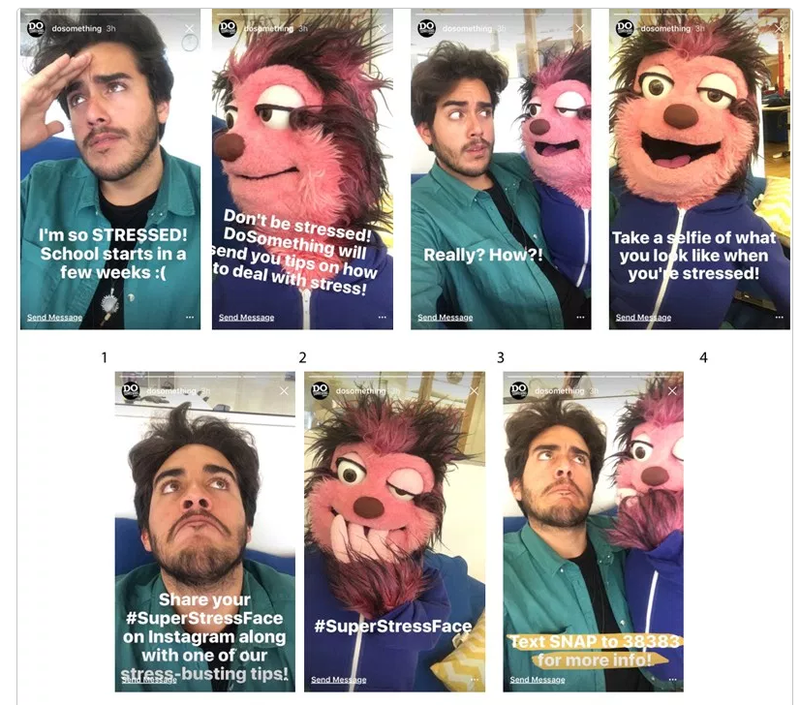 Example: Do Something uses multiple CTAs throughout their Instagram story. But instead of a person telling you to perform an action, they used a silly looking puppet. Entice followers to view your story by posting exclusive content that can only be found on your Instagram story. This is a great way to get your followers excited about watching your story everyday! Keeping up your content across all social media platforms can be a time-consuming and complex task, especially since each piece of content you post should be unique. Plan your content schedule ahead of time to make your life a lot easier. Recommended Action Step: Use scheduling tools like LATER that specialize in helping you organize your Instagram content. There are not many places that you can add a hyperlink on Instagram but with Instagram stories you can tag relevant brands, influencers, accounts, etc. within the story. Recommended Action Step: Tag or mention whomever you can. The tagee will receive a notification and will likely share your story with their followers, increasing your reach. Example: Cheerios makes their audience feel special by tagging them in a Instagram story video clip with a personal message. Instagram stickers are a fantastic way to add some fun and silliness to your story. However, used out of context they can actually take away from the story. Ensure that you’re using stickers when they make sense within the context of the story. For example, it’s relevant for businesses with a physical location to use the location sticker. Recommended Action Step: Upload pictures and videos taken with the Snapchat filter to your Instagram story. Choose a colour palette that is consistent with your brand’s colour scheme. Use the colour palette in your stories so that viewers know when it’s your brand! Recommended Action Step: If you press and hold on one of Instagram’s 9 colors, you’ll be directed to an entire color wheel where you can match colors to your brand’s color scheme perfectly!
? 16 Irresistible Instagram Themes You’ll Want to Copy Right This Second ? 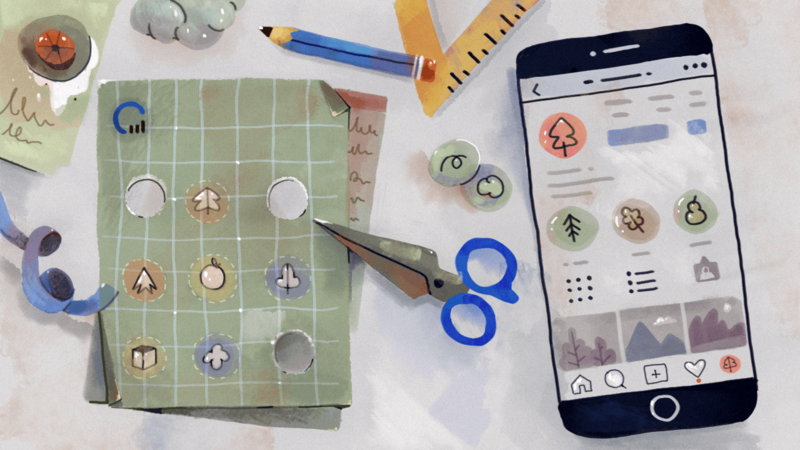 Use text and marketers to illustrate points, doodle on your images, and more! Recommended Action Step: Change the size of your font and pen tip or the type of marker you use to change up your stories look. Determine how much time you need to tell your story. One Instagram video clip can be up to 10 seconds long and an entire story can be 1 minute long. Recommended Action Step: Post Instagram stories shorter than 1 minute. Small bursts of content are more engaging for your followers. This is no secret, the more you post the more engaged your followers will be. Remember not to spam your followers with irrelevant content but focus on posting unique, fun, and useful content that will keep your audience engaged. Recommended Action Step: Post often because the more accounts that are watching, commenting, and engaging with your story, the more likely your account will end up on the “Explore” page next to other trending stories. Instagram now lets users view their Instagram story insights. This includes views, likes impressions, comments, reach, engagement and saved. 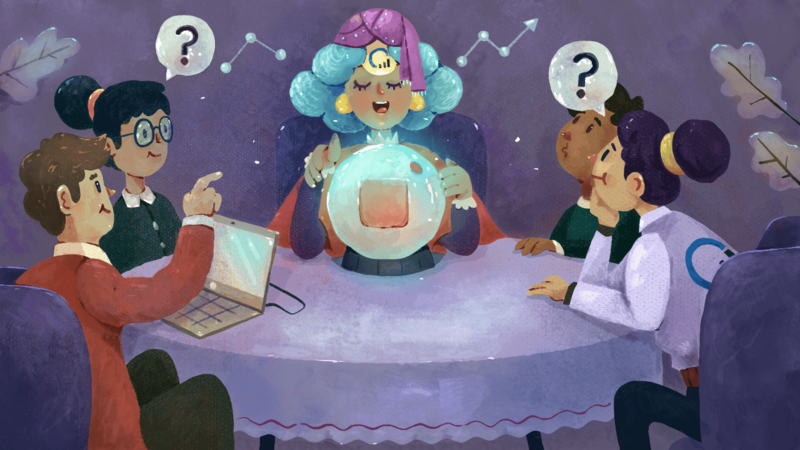 Recommended Action Step: Be sure to pay special attention to the stories that are being saved as this analytic reveals the content your audience loves the most. Your brand can take your audience engagement to the next level just by thinking outside the box with your Instagram stories. Take the time to brainstorm with your team about what kinds of content you can publish on your story. And please, let us know! Do you know of any brands with awesome Instagram Stories? Let us know in the comments!